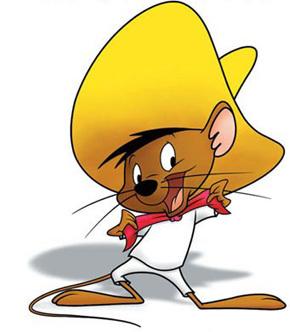 Known for being “the fastest mouse in all of Mexico,” Speedy Gonzales made his cartoon debut in 1955. This little mouse has the ability to move quicker than Daffy Duck and Sylvester the cat, two of his enemies. This Looney Toon character is very intelligent and uses his brain to outsmart his enemies. If you are looking for a unique Looney Toon costume for your next Halloween party or dress up event, you can make your own Speedy Gonzales costume in little time and for little money. Fold a long piece of brown felt in half. Draw a semi-circle on the felt that is approximately 4 inches in diameter with a 1-inch opening along the fold. Draw a second circle with the exact same dimensions. Cut them out using fabric scissors. When you unfold the felt, they should each take the shape of the number eight. Draw a circle on a piece of pink felt that is approximately 3 inches in diameter. Draw a second circle with the exact same dimensions. Cut both of these circles out. Use hot glue to attach one pink circle to one half of the two brown eights and the other pink circle to one half of the other brown eight. Allow the glue to dry. Place hot glue on the inside ends of a brown headband. The ears must be placed near the ends of the headband so that they will be seen when you put the sombrero on. Attach the brown felt to the sides of the headband by placing the center of the eight shape on the glue with the pink circles facing forward. Place glue on the back side of each piece of brown felt, fold the two sides of each piece up around the headband, and squeeze them together. Allow the glue to dry. Wear a pair of white shorts or capris that should fall between the knee and the ankle. Wear a white long sleeve T-shirt with a crew neck collar. Attach a mouse tail to the center back of the shorts. You can make the tail by cutting out an 8 inch long rectangle that is 1/4 inch thick from a piece of brown felt. Then either hot glue it in place or use a safety pin. Tie a red bandana around your neck. Let the ends hang loose. Wear your mouse ears. Then put on a large yellow sombrero. If you cannot find one that is yellow, spray paint it using yellow paint. Paint your nose black and draw two whiskers on either side of your face. Wear brown socks, shoes and gloves.